[Kyoto, LTTW] On June 1, 2011, the sacred Dragon Hall of the Daitokuji Temple was once again used for a special ceremony after hundreds of years. 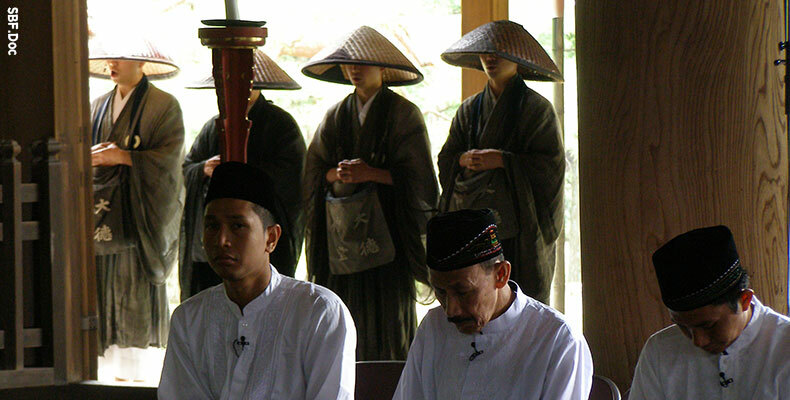 For five years, the On Zen ceremony has been delivered in a unique way in which “music” is an intrinsic part of the ritual. The world-renowned composer and percussionist Stomu Yamash’ta has been the key figure in both composing and performing such a ritual music. Using the only Sanukit (the stone percussion instruments) in the world, Stomu Yamash’ta has successfully incorporated art, spirituality and state of the art technology in the music. In this 5th ceremony, Yamash’ta and the Daitokuji’s chant monks hosted special guest musicians. Hideaki Masago of Kanagawa contributed the beautiful Native American ritual music with the flute, while Akao Michiko of Tokyo added the traditional Japanese flute flawlessly. Marzuki Hasan, Muhammad Taufik and Zulfikar, musicians from Aceh, Indonesia who presented their Sufism-influenced traditional music, also joined the ritual. This year’s ceremony also had the honor of Nakayama Genshin of the Tendai Sect from Mt. Hiei who shared his chanting. Zen Master Iwatsuki Shin of Soufukuji Temple, Fukuoka also gave his rare appearance in this event. The ritual was meant to celebrate interfaith mutual respect as well as to pray for the victims of tsunami caused by the recent earthquake in northern part of Japan. The Daitokuji’s Zen Master Takada Myouho himself led the chanting of the monks, and 200 distinguished invitees attended the ceremony. The idea of having On Zen Ceremony has been accommodated by Reverend Sosho Yamada who has worked closely with Stomu Yamash’ta right from the beginning. The Ceremony has been performed in Paris, France in the past three years.